The landforms of the Central Asian deserts feature distinctive relationships with their geological structure. These relationships, however, are much more complex than simple structural inheritance. The Neogene-Pleistocene continental and marine deposits form the major part of the Turanian plain. Their thickness attains 4000 m (Geller and Rantsman, 1968; Babaev, 1996). According to their genesis and hypsometric conditions, sharply distinguished levels may be identified on the plains of Central Asia. Loose sandy deposits mainly form the first one, with elevations ranging between 130 m b.m.s.l. and 200 m. In the south, south-east, and east it is surrounded by piedmont plains. The second, higher level, with elevations ranging between 200 m and 400 m, comprises the Ustyurt plateau and adjoining uplands (e.g., Krasnovodsk and Mangyshlak) and is formed by the Mesozoic and Tertiary marine deposits. The data from deep drill cores show the presence of post-Jurassic sedimentary rocks. During the upper Paleozoic and also during the Mesozoic this area experienced active tectonic movements, which resulted in intensive erosion, transportation, and accumulation of material. During the Paleocene increasing tectonic activity progressively transformed the landforms. The second half of the Paleocene featured very active formation of folds in the southern part of the Turanian plain (Geller, 1968). Since that time the major part of Central Asia has entered a phase of continental sedimentation. An exception is the western part of the area, which was occupied by Neogene and then Quaternary bays of enclosed sea basins that constantly changed their level and configuration (Varuschenko et al., 1987; Babaev, 1996). The rise of the Pamir-Alay mountains resulted in formation of river valleys, which now cross the plains of Central Asia (e.g., the Zeravshan, Syrdarya, Amudarya, Chu). The formation of the Transunghuz desert dates back to the Pliocene epoch, or more precisely to the period between the late Sarmat and Pont, according to the paleo-graphic stratification of the Caspian Sea. The Neogene-Paleogene alluvium of the Amudarya was a principal source of redeposited material in this region. The granulometric composition of these strata is very similar to the present-day alluvium of the upper course of the Amudarya. The river sediments alternate in some places, especially in the western part of the Transunghuz, with lake sediments typical of alluvial plains. The lower part of the Transunghuz stratum is dominated by non-redeposited alluvium (Babaev, 1996). According to much paleogeographic evidence, the Central Asian plains were dominated by dry and continental climatic conditions during the entire Cenozoic. Vertical tectonic movements in the middle Pliocene created boundaries of the major desert regions, which were similar to those of the present. During the phase of the simultaneous accumulation of aeolian sand strata, the upper Neogene deposits were gradually separated in many places (Geller and Rantsman, 1968). Deep drilling has disclosed valley-like depressions, which had resulted from the ancient temporary inflowing streams (Babaev, 1996). Their extremely non-uniform depth along their longitudinal profiles, however, suggests that these longitudinal valley-like depressions, similar to the Unghuz valley, should be regarded as channels resulting from very short temporary runoff rather than as paleo-river valleys. The continental Pliocene and Pleistocene deposits extend over almost the entire territory of the Central Asian deserts and are represented by diverse genetic types. They include the pre-Amudarya river deposits dating from Paleocene to Pleistocene, the Murgab and Tedjen Neogene and Quaternary deltas, the upper Pleistocene alluvium of Afghan rivers and the Sarakamysh, and Aral late Quaternary and Holocene deltas of the Amudarya and Syrdarya rivers (Babaev, 1996). During the late Pliocene and early and middle Pleistocene the main factors introduced in the sediment accumulation and relief formation were fluvial erosion and accumulation. The young river systems starting in the mountains cut deep valleys across the piedmont plains. Later, these valleys were filled and covered with thick alluvial sediments over a large zone along the mountain slopes of the Kopetdagh and Parapamiz. The Pleistocene deposits of the Karakum and Kyzylkum accumulated predominantly under dry climatic conditions. During the warmer periods of intensive melting of the glaciers in the mountains, large wandering river systems were fed by the increased flow of water from the mountain slopes. The erosion processes were especially active on the piedmont plains, where poorly cemented sandstones and loess-like loams were extensively washed out by occasional streams and then further reworked by wind erosion. Marine deposits are present only in the western part of the Lower Karakum desert. Here, apart from the Pliocene deposits, there are also the Pleistocene deposits corresponding to the Apsheron, Baku, and Khazar transgressions of the Caspian Sea of the early and middle Pleistocene, and to the most extensive Khvalynian transgression of the late Pleistocene (Varuschenko et al., 1986). The geomorphological systems of Central Asia comprise low and high plains of various origins and ages as well as the relict mountains (inselbergs) and piedmonts of surrounding high mountain systems. Most of the sandy deserts of this area can be classified as aeolian-alluvial sands (e.g., the Karakum, Kyzylkum, and Muyunkum) (Figure 12.4). Their less widespread variety — Aeolian-deltaic sands — are restricted to the ancient deltas of rivers, which flowed into the Aral and Caspian Seas and Lake Balkhash. They are distinguished by better sorting and a large admixture of very fine particles (Petrov, 1976). Aeolian-alluvial sands are restricted to the piedmont plains. They are poorly sorted and often enriched with pebbles and gravel showing signs of aeolian weathering. Aeolian-sea coast and lakeshore sands are the result of the winnowing of sand deposits during their desiccation. They form the coastal dunes of the eastern Caspian and the Aral coasts. They are usually medium- and coarse-grained and not very well sorted. All these genetic types of aeolian sands were formed in situ by the winnowing of loose sand deposits (parent material) and are therefore called 'authigenic' (Sidorenko, 1961; Petrov, 1976). In contrast, the aeolian sands of stony structural plains consisting of pre-Quaternary sandstones (e.g., the Ustyurt plateau) are mainly formed by the introduction of wind-borne sands from elsewhere and only partly by deflation of the underlying conglomerates and other stony bedrocks. They are termed 'allogenic' (wind-borne). Despite some variations in the relief of the Central Asian sandy deserts, longitudinal dune ridges are dominant, but only some of them are entirely aeolian in origin. 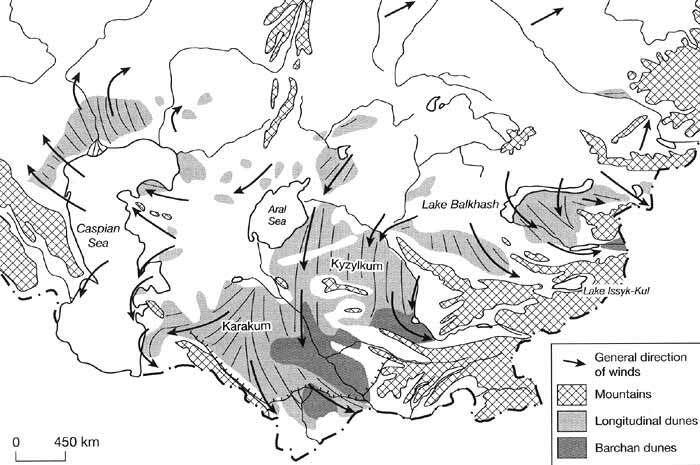 In many regions of the Karakum desert, the dune ridges were shaped by alluvial processes in the Pleistocene and Holocene and then were partly reworked by aeolian processes (Geller and Rantsman, 1968). Meteorological observations carried out since the beginning of the 20th century in the Lower Karakum indicate a rather complex wind regime, with a dominance of westerly, north-westerly and north-easterly winds. This region, however, is characterized by dune ridges that extend along the meridian (Figure 12.4). Most sand ridges are asymmetrical (i.e., one slope is steeper than the other). The ridges themselves are composed of individual hillocks formed from loose sand deposited around shrubs. In the Karakum the parallel extension of dune ridges often does not correspond to the dominant wind direction. Moreover, granulometric analyses of the sands of the Lower and Transunghuz Karakums showed that the sand particles in the sand dunes are very poorly rounded except in the top several metres (Sidorenko, 1961; Geller and Rantsman, 1968; Veysov, 1976; 1988, pers. comm.). According to these authors, aeolian processes have never affected the major part of the sand material in the Lower Karakum. Also, the structure and composition of ridges in the southern part of the Karakum contradicts the idea of an aeolian origin of their formation. Both the kyrs of the Transunghuz, mainly formed by bedrocks, and typical sand ridges of the Lower Karakum, which contain clay strata in their profile, could not be formed by aeolian accumulation. Excluding the dominant role of wind, many authors attribute the relief of longitudinal valleys and ridges to the activity of fluvial processes. The sand ridges are formed from alluvium, and only their upper stratum was affected by aeolian activity. At a certain depth, features of aeolian impact disappear. Thus, the depth of relief dissection of sand ridges is several times higher than the depth of aeolian influence (Geller and Rantsman, 1968). It is noteworthy that the ridges of the Karakum are generally perpendicular to the ridges of the Kopetdagh and Pamirs. Even today, during floods, temporary water streams flowing from the Kopetdagh slopes penetrate the desert for several dozen kilometres. The Tedjen and Murgab rivers have reached the Unghuz valley in the recent historical past (Letolle and Mainguet, 1993, Babaev, 1996). It is very likely that under more humid conditions in the Pliocene and early Pleistocene, similar flood flows from the mountain slopes could penetrate the desert for much longer distances. The parallel longitudinal extension of the ridges might be explained by the fact that temporary flood flows should have a very much higher velocity than permanent rivers and would follow the direction of their valleys on the mountain slopes. This is why meandering does not affect the straight, longitudinal form of the ridge relief of the southern Karakum (Geller and Rantsman, 1968). However, only the biggest ridges of the southern Karakum have a fluvial origin. Smaller dunes situated between higher ridges, as well as the longitudinal dunes of other deserts of Central Asia, are believed to have an aeolian origin. (VII) barchan chains form, perpendicular to the wind direction (Walter and Box, 1983). According to much paleogeographic evidence, the formation of desert conditions like those of the present started in Central Asia with progressive global cooling and aridity in the early Pleistocene (Varuschenko et al, 1987, Borzenkova, 1992). Climatic variations through the Pleistocene resulted in multiple shifts from hyper-arid deserts to subhumid shrublands (Tarasov, 1992, Varuschenko et al, 1987). However, in contrast with some other desert regions in the world (i.e., the Sahara or Thar deserts), these environmental changes had relatively small amplitudes so that during the entire Pleistocene the plains of Central Asia were constantly dominated by dry climatic conditions. The last maximum of aridity occurred between 20 and 17 Ka BP, followed by an increase of precipitation during the Lavliakan humid phase. This was synchronous with the New Caspian transgression in the Holocene (Varuschenko etal, 1987; Kes, 1995). The landforms of the Central Asian deserts carry relict features both of relatively short humid intervals with runoff higher than nowadays and long arid phases. The activity of ancient water flows during the periods of glacier melting in the mountains of Parapamiz and Tien-Shan left their distinctive traces both on the piedmonts, dissected by deep dry valleys, and on the aeolian plains, where alluvial fans formed, altering their location at each stage of alluvial deposition. The absence of flood and lake deposits in the eastern part of the Karakum results from the shift of the Amudarya from its ancient valley across the Lower Karakum to its present-day riverbed. This change was not due to the blocking of river flow caused by a gradually growing body of sediment, because it occurred rapidly and did not noticeably affect the composition of the deposits. According to Babaev (1996) it was most probably caused not by accumulation of alluvium but by tectonic movements resulting in an increase of erosion. The flat relief of the sandy alluvial plains after the long phase of alluvial accumulation gradually began to experience weathering and reworking by the wind. Available paleogeographic, palynological, and archeo-logical data suggest that during the late Pleistocene and Holocene the alternations of arid and subhumid intervals in this area were generally synchronous with other desert zones of Asia and North Africa and that they correlated with global warming and cooling intervals (Borzenkova, 1992, Varuschenko etal, 1987; Lioubimtseva, 1998). A severe arid phase occurred during the last glacial maximum (c. 20-18 Ka BP). In Kazakhstan, annual rainfall decreased at that time by not less than 150-200 mm, mean July temperature was 2°C lower than at present, while the mean January temperature dropped by 12°C compared to the present (Aubekerov, 1993). According to pollen data in western Turkmenistan, the mean annual temperature decreased by 4.5°C (Kes et al., 1993). Such climatic conditions intensified aeolian activity and loess accumulation (Liu et al., 1995). According to the latest research of Dodonov (1997, pers. comm. ), intensive processes of loess accumulation (more than 0.3 mm per year) also occurred in southern Uzbekistan and Tajikistan. Cool desert conditions also resulted in very low levels of the Caspian and Aral Seas. In the history of the Caspian Sea, the interval between 25 and 16 Ka BP, known as the Yanotaevsk regression, saw sea level drop to 64 m b.m.s.l., and for a short period, even to 135 m b.m.s.l. (Varuschenko et al., 1987; Golubev, 1998). The middle Holocene global optimum caused a significant increase of precipitation in many desert regions of the world. In Central Asia, the Holocene climatic optimum is known as the Lavliakan humid phase and has been dated in different archeological sites from 8 to 4 Ka BP, with a maximum around 6.5 Ka BP (Mamedov, 1990). Such climatic conditions favoured the development of Artemisia and Gramineae steppes on the currently lifeless plateaux of the Caspian-Aral watershed. In the Holocene history of the Caspian Sea, three transgressive intervals correspond to the optimal conditions in its basin: 8-6 Ka, 6.4-5.4 Ka, and 4.3-4.1 Ka with maximum sea levels of: 16.5-22, 18.5-28, and 18-22 m b.m.s.l., respectively (Varuschenko et al., 1987). According to available pollen data in northern and eastern Kazakhstan, the dry cold steppes of the Younger Dryas were replaced in the Holocene by more moisture-demanding forest-steppe vegetation with a maximum increase of arborescent species (Aubekerov, 1993; Tarasov, 1992). These changes in precipitation and vegetation cover resulted in a decrease of erosion and favoured soil accumulation processes. Inflowing rivers crossing the deserts of Central Asia play a key role in the hydrological system of this area. The Amudarya results from the confluence of the Pyandzh and Vaksh rivers in the Pamir mountains at an altitude of 4900 m (Letolle and Mainguet, 1993). Its entire length, including its main tributary, is 2540 km. Its active basin covers about 309 000 km2. It collects water from four main tributaries: the Kyzyl-Sou, Vaksh, Kafirnigan, and Sourkhandarya rivers. The Amudarya transports a considerable amount of clay and sand particles (from 1 to 3.5 kg m-3), which is the second biggest river sediment discharge in the world after the discharge of the Huangh in China (Letolle and Mainguet, 1993). The formation of the pre-Amudarya valley resulted from the uplift of the alpine system, when the south edge of the present desert area began to rise. The pre-Amudarya carried an enormous amount of suspended material. It has deposited a stratum of alluvial sand and clay whose current thickness attains about 600m. Paleo-evidence suggests that the Zeravshan ran into the Amudarya in historic times. Today, the Zeravshan, 870 km long, ceases to flow in the desert after nourishing numerous irrigation canals around Bukhara and Samarkand and giving part of its water to the Amudarya via a canal near Bukhara. According to paleogeographic data the Zeravshan river valley was formed much earlier than most other Turanian river valleys and has never experienced considerable changes (Babaev, 1996). On the other hand, the Syrdarya became a single artery only at the beginning of the Pleistocene, as a result of the combination of multiple smaller river systems of separate drainage areas on the mountain slopes. The same is true for the Chu, which formed from a number of closed river systems into a single river artery only in the Pleistocene. Today, the Syrdarya is 2212 km long, or 3019 km with its tributary — the Naryn. Its basin comprises more than 219 000 km2 (Letolle and Mainguet, 1993). The only important tributary that the Syrdarya receives on the plain is the Chirchik. The latter is only 160 km long but has a flow of 224 m3 s-1 descending from the mountains. The Chu, 1400 km long, starts from the glacier in the Terskey-Alatau and, crossing the sands of the Muyunkum deserts, loses itself in a series of small lakes (e.g., the Akzaikin and Aschikol), before finally flowing into the small Terekol Lake together with another desert river — the Sarysu.